PLEASE ASK QUESTIONS, IF NECESSARY, BEFORE PURCHASING ANY OF OUR FINE ITEMS. WE WILL ANSWER ANY QUESTIONS AS SOON AS POSSIBLE. 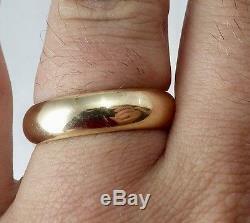 FABULOUS VINTAGE 14K YELLOW GOLD MEN'S RING/BAND. ENGRAVED "RUTH TO BILL, 3-8-48". 6MM WIDE-RING SIZE 9 3/4. 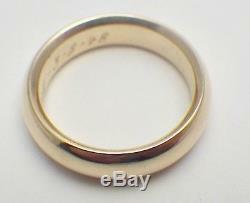 This is truly a great looking and classic vintage 14K yellow gold men's band. The 6mm wide band is engraved inside with a year of 1948 (see description). This is a great ring that really stands out when worn. All packages will be sent first class, unless otherwise stated. The item "Vintage 14K Yellow Gold Men's Ring/Band Engraved 6MM Wide Size 9 3/4" is in sale since Tuesday, February 21, 2017. This item is in the category "Jewelry & Watches\Engagement & Wedding\Wedding & Anniversary Bands\Bands without Stones". The seller is "randrjewelersokc" and is located in Oklahoma City, Oklahoma. This item can be shipped worldwide.